Paradigm-shifting can occur in an instant; one can see the shift instantaneously. Shifting an inner paradigm of how you are in the world takes a longer time and seems to be more incremental. Being different is more challenging than seeing the shift. Using a picture to show a paradigm shift can exemplify the first process. 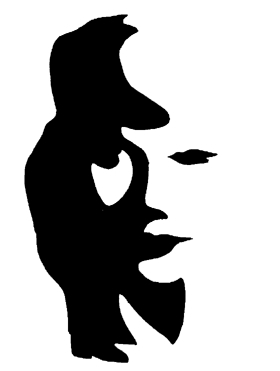 Above is a figure/ground image that is marked in shadow and light. The figure in the foreground is of a man playing the saxophone or smoking a large pipe; the image in the background is of a women’s face, the shadow defining her features, hair, and neck. Seeing both is a shifting between the figure and ground or two paradigms – once you are able to do this you instantaneously experience the paradigm shift. When you internally experience a paradigm shift you can at times feel it instantaneously like the story told by Steven Covey in The Seven Habits of Highly Effective People, about a young man and his children on a train. The children are acting-out and an observer is annoyed by this. Then the observer discovers that the father is emotionally flat and not stopping the children from their effusive behavior because he wants them to have the opportunity to be like children as they had just left the funeral home and burying their mother, his wife. The observer upon hearing this has an internal paradigm shift from thinking the father is a bad father for not controlling his children to having empathy for the children, and the father, for their loss and seeing what a positive choice the father has made to not squash their behavior. That shift occurs immediately but having a truly changed internal paradigm shift, and acting, perceiving and interacting in a more compassionate way, is a longer process that develops over-time in response to the immediate internal paradigm shift. Covey refers to this as an inside-out process. I perceive true or real and sustaining, therapeutic change as an inside-out process. It is a function of being self-aware, knowing oneself and acting congruently with one’s internal perceptions, knowings, beliefs, and motivations. This is self-awareness and personal responsibility in actions and interactions. Versus a lack of self-awareness and a style of blame or seeing the responsibility outside oneself. I talk about this as Being the Change. Covey talks about this as changing Have to Be. If you want to have trust then be trustworthy … or if you want to have a happy marriage then be the kind of person who generates positive energy and sidesteps negative energy rather than empowering it (empowering the negative energy by focusing on and giving energy to it). Being mindful in your evaluations and actions, and applying compassion and lovingkindness, will bring you to this process easily and thoroughly. By thoroughly I mean deeply; it will be meaningful and feel real, solid, and strengthening. One of the primary ways to address this inside-out process is to change a sense of internal insecurity to a focus on developing a sense of internal confidence. Insecurity engenders negativity and critical evaluation that excludes compassion. Confidence engenders positivity, harmony, and critical evaluation that embraces compassion. The first is disconnecting and the second is connecting or re-connecting. Changing one’s internal paradigm for interaction from disconnecting (protecting of self, defensiveness) to connecting (knowing one’s self, and focusing on harmony, compassion, and love) is a characterological paradigm shift that will allow one to be, and view interactions from an inside-out perspective. It’s the paradigm of being connected rather than being right. Arguing to be seen as right and the other wrong often creates adversity rather than connection. When, in interaction, the internal paradigm is to be connected or sincere harmony – then one is drawn to seek first to understand as Covey describes it, and look for the connecting threads rather than looking for the places where one disconnects. Successful and effective mediation and negotiation are based on this internal paradigm. It is a function of mindfulness, and a willingness to be balanced in one’s evaluations and interactions. Incorporating not just one’s personal view of the situation but being willing to understand another’s perspective of the situation and incorporate the elements of both. This style of interaction, this internal paradigmatic-based behavior, allows for connection and harmony. These all together determine inside-out change. Be the Change you wish to see in your world; when you are being it you will see it in all your interactions and relationships. Everyone has a personal style of being in the world and a personal style for communicating and learning. From a solutions focused perspective in therapy, in order to help another I have to figure out those styles and match them in how I communicate and provide assistance toward solutions. This takes a combination of focused listening skills, intuition, quick thinking, and flexibility. Using mindfulness when approaching interactions allows for more connecting space. Each person relates on four intersecting levels. They are a continua of abstract to concrete; sensing to intuitive; thinking to feeling; planned to spontaneous. Each end of these poles has trouble understanding or consolidating information from the other extreme end. So individuals who tend to perceive the world in a more abstract fashion have difficulty with individuals who are concrete. This is the same for individuals who tend to gather information in a sensing, fact observational (left-brained) way versus those who tend to gather information in a more intuitive fashion (right-brained). The style in which one expresses information can also create misunderstanding if too far apart on the continuum of thinking and feeling. Here the issue is more of a proactive versus a reactive perspective, using objective versus subjective information to both make decisions and express those decisions. The final level of interaction has to do with planning and spontaneity. This is somewhat obvious, if a person values planning then spontaneity is frustrating to them and visa versa. For effective communication to occur one needs to assess his own position as well as that of the other on these four continua. Some careers value different aspects of these four groups. Most people are on a continuum of thinking and communicating skills from concrete to capacity to abstract. Engineers tend to be at the concrete end of the continuum and artists tend to be at the abstracting end. Most of us live somewhere in the middle. This information is important in parenting especially if you and your child are at different places on a continuum. Developmental stages can at times lead to a more concrete style of thinking and processing information for children. But it is also a function of a child’s right-brained-ness or left-brained-ness. Right-brained individuals are more on the abstracting end and left-brained people are more on the concrete end. The more diverse or greater the crevasse between people, the less able they are to understand each other. And a misunderstanding between them, can feel like an assault to a person’s character rather than a re-direction or teaching when it is related to a difference in information interpretation and consolidation style. An example of this is the way in which a very left-brained person might interpret the information gathering style of a right-brained person; she might be seen as flighty or unable to substantiate her perceptions because they come from a more intuitive perspective. A person who tended to be more feeling in their style of expressing information would be seen as subjective and not having an objective reason to feel the way they do. For a child who tended toward this style of relating, she might have difficulty learning from a teacher she interpreted as not liking her, because the teacher might be more objective and less touchy feely and this might result in the child feeling like the teacher doesn’t like her. A child who was more on the feeling aspect of the continuum might then have more difficulty learning from that teacher. The work in parenting is to help the child manage her emotions and feelings and increase her understanding of her personal style in relating and interacting in the world. This would need to be accomplished without deflating the child’s personal style but by developing the other aspect of the continuum. The best way to do this is to help the child investigate whence their feelings come and to evaluate the objective aspect of their feelings. This helps the child develop her thinking skills related to her feelings. And develops both aspects of the continuum of thinking and feeling as well as both aspects of the sensing and intuition continuum. Children who have strong intuition will often have information they have gathered from an observation perspective of subtle changes in behavior or facial cues from the other person whom they feel doesn’t like them. So it might look like they are being subjective in their decision-making rather than objective, but there is an objective – observation of real information – in their decision-making process. In these instances it is then useful to help them focus on learning for their own benefit rather than to appease or make happy their teacher – as they may be correct in their sense that the teacher doesn’t like them. Individuals who have developed both their right-brained and left-brained style of gathering and expressing information are the most flexible and generally perceived of as affable, well-liked, and quite bright. Myers and Briggs developed a test for preferred style of being in the world from Carl Jung’s work on this subject. It has been used as a psychological test to help individuals understand their preferred style for years. It is also used in business consultation to help build teams. I prefer a book by Kiersey-Bates, called Please Understand Me, that is very comparable to the Myers-Briggs test. The basic information is useful to help build teams but I tend to use it in couples counseling and parenting to help individuals see where they are mis-communicating and help develop an overall ability on both aspects of the four continua. When interacting with someone you love, a team partner, or a child, it is useful to do some investigation about how each one of you got to specific information when you find you are in disagreement – it may be that you are perceiving different information or interpreting that information differently and you may be able to find agreement if you increase your understanding of each other. This leads to paradigm shifting and an increase in one’s mindfulness in interaction. Throughout my practice I have worked with dreams to help others develop an inner connection with their intuition. Right-brained-ness is that part of your brain that knows things and makes connections but doesn’t have a connection to language because language is a left-brained thing. Dreams are often right-brained in nature and so they seem inexplicable from a left-brained perspective. Images in the dream are representations of holistic things and not just one-dimensional. Smells and touch are right-brained – it’s part of what happens with babies they make connections to mom through their right brain capacity because they haven’t developed language yet. Have you noticed how certain smells can evoke intense memories moving you precisely to the moment in time that connects with the smell? Certain smells for me instantaneously evoke images of my childhood, my grandmother, and powerful experiences from my past. This is a negative too for individuals who have experienced trauma – often the last image to be released is the smell of the persecutor or what smell was around them when the trauma occurred. My daughter, when reading will often stop and look at the illustration to assist her in consolidating the pictorial and written information presented. She is, like her father and I, predominantly right-brained. A gift and a curse really – it allows for an extraordinary style of gathering information but can be distracting and difficult to control as a young person, especially in our left-brained dominated world. If not observing her closely, this stop-and-start style of reading could be misinterpreted as an inability on her part to read, when in reality it is a style through which she incorporates information. She is strongly right-brained, and so utilizes illustration and holistic processing to fully incorporate information. Dreams come to us through our unconscious to assist us in problems that are difficult to resolve or process. Jung would use the process of dreaming to access what he called the collective unconscious by considering the problem on which he was working before going to sleep at night. Many of us automatically use this same method to resolve our problems. When we have something that is bothering us, that is nagging us in the back of our minds, we will find that we have strange dreams that will help us to resolve the conflict. The problem is in the background of our thoughts. In Dreamtime this becomes the focus of our unconscious so that we can gather information that is outside of our thinking style – this is where right-brained information can be utilized and provided. Interpretation of the dream information can be problematic. If we try to understand right-brained information, or holistic information, from a left-brained perspective then we will lose the illuminating information of the dream. There are books written about the meanings of various images in dreams – but I find this is a left-brained approach to a holistic problem. Yes, certain images are from the collective unconscious and therefore may be part of a list of meanings, but for the most part meaning is personal and individual. Much like meaning of words in language, images take on specific meanings to specific people due to their life experiences and culture. So how can dreams increase or develop our mindfulness? By making connections about images in the dream that are holistic and personal in nature, as well as being open to the right-brained nature of information gathering. Recently I had a very interesting dream that may be illustrative of this. I cannot write out all of it here but will attempt to give the general information and how it pertained to the problem; there are many minor elements to how this dream was presented in my unconscious that are helpful and instructive to me, but to present the entire analysis would take too much room. The dream is of me in a classroom in a large city with many professionals in the field. I am the focus of a test. Flowers are presented and I am to make comments, observations about them. I do, including identifying changes in the smell of one of the flowers when presented with the other. Additionally, I incorrectly name one of the flowers. The incorrect name is a reference to a play I studied in college about a woman’s cleverness to change individuals’ belief systems and to develop an integrated union that results in peace. The smell is of cloves and this has a number of important meanings with respect to the problem and chinese medicine. The flowers are herbs that I use in chinese medicine to treat lung, heart and liver channel issues that might result in cardiovascular problems. Although I originally mis-quote the name of one flower I later identify it correctly and win the prize. The identified lesson, stated in the dream, had to do with perseverance in investigation, observation of the changes when the flowers were combined, and how it is important to know the effects of things individually and in combination. Upon awakening my holistic analysis of the information allowed me to use the meaning of the flowers within the context of my chinese medicine training and the meaning of the play from my understanding of having studied it in school as well as my psych training. The dream was answering a question I had been struggling with about an anomaly in my breathing – giving me information about how to address it from a chinese medicine perspective while simultaneously providing holistic information about other aspects of what was contributing to the identified problem. Looking at the various paradigms of each part of the message – the meaning of the flower, the meaning of the flower within the context of both homeopathic and chinese medicine, as well as the meaning of the smell and of the mistaken name of the flower – and integrating these provided a multidimensional answer to the identified problem. This integrative approach increases and develops mindfulness. Not all dreams are this profound. Many are just snippets of the day, but using your dreams to develop mindfulness is highly effective and will increase your understanding of yourself and how you are in the world. One of my favorite sources for working with dreams is a book called Inner Work by Robert Johnson, an extraordinary Jungian therapist and writer. His book discusses the general concept of lucid dreaming but focuses more on how to work with your own unconscious to understand the messages in your dreams. One has to move out of the dualistic of right/wrong, victim/persecutor perspective and into a transcendent consciousness of compassion and mindfulness. Taking action to promote peace and grace rather than proving you are right or punishing another for their mistakes, shortcomings, or perspective. True dialogue can only occur when people are interacting from this perspective. Dialogue is a negotiation and discussion where there is a give-and-take through an attempt to understand each other. In my work providing business consultation and as a mediator, I use a book by Steven Covey called The Seven Habits of Highly Successful People. In it he prescribes a specific style of interaction for real negotiation to take place. Each party must take the position to Seek First to Understand. What this means is that one must use a mindful approach to understanding. Not a litigator or debater approach wherein you are looking for the flaws in the position, but rather a mindful approach where you are attempting FIRST to understand whence the person is coming and then offering your own perspective. Clarifying the position of the other fully before identifying what your own position is. This action then allows for a paradigm shift – through mindfulness – so that a true negotiation and dialogue can follow, where each is attempting to resolve the situation or conflict to meet the needs of BOTH people, which he calls win-win. Seeking to First understand leads to mindfulness, paradigm shifting and graciousness in behavior. Often with conflicts in relationship both parties are right from their respective perspectives. The conflict results as they are each looking at the situation in a limited, singular fashion, from only their own perspective, unable to communicate because they cannot hear or see each other’s distinct perspective. Sometimes resulting in a digging in of their heels, each requiring the other to acquiesce to their position, and a stalemate ensues. The conflict becomes solidified as each marshals forces to prove the rightness of their own position rather than moving to understand the position of the other. This is problematic in relationship or dialogue where an understanding is sought rather than a winner or victor. It would be easier to get to the middle way if both parties could see the other’s point of view but that is veiled by the emotion of proving the rightness of a perspective, a dualistic tendency. This is most obvious when two religious or political perspectives are the focus of the negotiation but I see this in families, partners, business colleagues, and parents and children. In these later groups it would seem obvious that a conflict could be avoided by simply acknowledging or remembering that the other would not be trying to or intending hurt, but trust is a core issue in many relationships so that people jump first to protect, defend, and into conflict rather than to understand. Stress magnifies this reactive behavior and increases the difficulties in focusing mindfully and acting with proactive, compassionate behavior. Graciousness as a behavior is to rise above or transcend that push or pull to conflict and be mindful, compassionate, and understanding. Waiting to speak, seeking to understand, breathing, meditating, and praying all allow for the space and time for graciousness to be the chosen action in conflict. Being right in relationship is often less important and less instructive than understanding or connecting. Focus on connection and understanding. I have found that graciousness is healing and instructive, especially under stress, in relationship and team-building. May you be overcome with mindful, gracious behavior in all your interactions. Trisha Yearwood wrote and sang a song called I would have loved you anyway. It touched me the first time I heard it. The words communicate the willingness to take the pain that comes with loss because the fullness of the connection outweighs the loss. This to me is the basis of truly living( and loving) mindfully, in the present moment. We cannot control outcomes but we can control our actions and how we connect with others in the present moment. The perspective of experiencing the whole of a relationship can allow for joy and sadness to be present at once and perhaps to allow for the joy to balance the sadness of the loss. This can be loss, as in a death, but it is also the loss when a relationship dissolves for one reason or another. The idea is that the outcome doesn’t diminish the importance of the connection while together. I have had important connections that had a finite timing. For me the beauty and importance of what was shared outweighed the ending and dissolution. Taking this attitude allows for time together to be powerful and honored rather than reduced in importance to the end result only, like a math equation. Relationships are not linear: this plus this equals that. Relationships are not reductive, where the sum can be reduced into its various components. There is something that is synergistic about the shared aspect of the relationship that stands alone as important. That aspect is connected to the outcome but has importance at least as great as the outcome itself. Each contact and connection in our lives has power. Sometimes the information gathered is to redirect our focus (like I need to learn not to do that in relationship), other times it is a picture of a perfect moment of how to live. Both matter. This is where the concept of mindfulness and paradigm shifting help to bring balance to one’s focus and living experience. In a dissolution of a relationship or loss through death one can be so caught in the sadness, or anger. This disempowers a person, one cannot smoothly move through the loss as a transition into another path – or continued path in life. This lodging in the emotion can cause a dam wherein one is caught and unable to move. This can cause all sort of dis-ease resulting in blockages in all aspects of one’s life – relationships, career, even health. It is important to hold on to the beauty and comfort and positivity of each relationship while transforming the negative aspects that may have led to a dissolution, or in the circumstance of a death, flowing through the emotional aspects of loss. This harkens back to the essential issue of holding on and letting go. To what you hold and to which you release is the essential question in integrating loss in relationship into your general being and worldview. Embracing connections fully brings the most joy, security and strength into your life experience. Think of recent losses and what was truly beautiful about the connection. Then do an inventory about what you may have difficulty releasing. See if you can use a focused meditation to release that held sadness or anger. Breathing out that which needs to be released so that you can be more free to bring the essential aspects of that relationship forward into your present moment and release that for which you have no control. Holding on is necessary in life, it is how the baby gets her milk, how the two stay together, and how a tree survives a tornado. It is also essential when in the middle of something that requires stick-to-it-ive-ness to complete. Holding on to values, family, friends, and connections that serve us is fruitful. Holding on can also stagnate Qi, block progress and impede smooth flow. Letting go is necessary in life. It is how the child is birthed, how the seed is set free to become anew, and how the adolescent grows into adulthood and leaves home. The cycle of life. It is necessary to let go of ideas, beliefs, and structures that don’t serve us. Letting go can also make it so that one is unable to finish projects, can’t stay focused or creates chaos. So how do you know when to do which? That takes wisdom and grace. It is a dynamic process of give and take, ebb and flow. It has to do with intuition, mindfulness, paradigm shifting, strength and flexibility. Holding on when it is the right time is necessary. Holding on beyond time hinders. Letting go when it is the right time is necessary for transformation. Letting go before it is time is traumatic. Being in sync with the ebb and flow in your environment, actions, relationships, and structures within time and space allows you to know whether to hold on or let go. Practice your mindfulness, and meditation skills so that you can feel and know what action is best for your optimal growth and development. There is a timing to things. You may notice that something bothers you now that has not previously, this may be a clue to a need for a shift in your holding on/letting go process. The more we attend to the whole of our feelings, and inner responses the more we can live in sync with our needs. This is one of the best uses of mindfulness to engage the bigger picture allowing for the incorporation of all the information that is present in each of our internal sensory systems.